We learnt about "maxInstances" in my PREVIOUS POST. "maxSession" is another configuration parameter which helps to set max allowed sessions to run at a time on that specific node. Here session means number of concurrent browsers in terms of all browser. It will not allow that specific node to open browser more than value of "maxSession". Let's understand with very simple example scenario. Example scenario : Let's consider simple example. I wants to run 2 software automation test cases and both should run on 2 different browsers concurrently(Firefox and Google chrome) using selenium Grid. But my another condition is, Node should open max 2 browser at a time. In this case, only "maxInstances" will not works for me but i need to use maxSession" in node configuration. In this case i can set maxSession = 2 for node to restrict only 2 browsers at a time. Let's understand how it works with practical example. Create bellow given software automation test cases in eclipse with given testng.xml file. Note : Please remove Internet explorer related code stuff from bellow given script if face any related error as it is not very stable with selenium grid. // Used dataProvider parameter to get data from @DataProvider annotation method. // Can accept object array data(browser name, First Name and Last Name) from getNames method. // Initialize browser driver as per data received from getNames(). // Set firefox browser capabilities for windows platform. // Set chrome browser capabilities for windows platform. // Set IE browser capabilities for windows platform. // Initialize RemoteWebDriver on grid 2 node with browser capability. // Pause test for 20 minutes to check exactly how many concurrent browsers opening at same time. // Open URL in requested browsers of node and execute test steps. // Can accept object array data(browser name, num1, num2 and expected sum value) from getNames method. // Initialize browser driver as per data received from getCalcData(). // Get actual result and compare with expected result. First of all let's run our software automation test without using "maxInstances" and then we will use "maxInstances" in node configuration to check how it works. Start grid 2 hub. You can view THIS POST to know how to start hub. Open command prompt and navigate to D: drive in command prompt where selenium server jar file, IEDriver server file and chromedriver file is stored. Start grid 2 node using bellow given command. 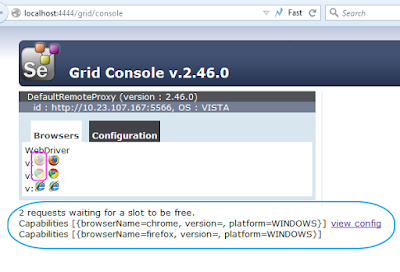 You can view THIS POST to know prerequisite to start grid 2 node. Now execute above given 2 software automation test cases using testng.xml file and observe test execution sequence. It will open 4 browsers at the same time and execute both test cases parallel in all 4 browsers. Close current running node using CTRL+c keys. Start node using bellow given command. Now we have used -maxSession 2 in bellow given command to limit max any 2 browser instances at a time. Now run testng.xml file to execute above given 2 software automation test cases and observe test execution sequence. It will open only 2 browsers at a time and 2 requests will wait for slot to be free as shown in bellow given image. You can see it by refreshing console page when your tests start execution. Once previous 2 requests will complete execution and close browser instance, Remaining 2 requests will be executed by opening new 2 browser instances. Means you will see max 2 browser instances at a time on your grid node machine to execute tests. 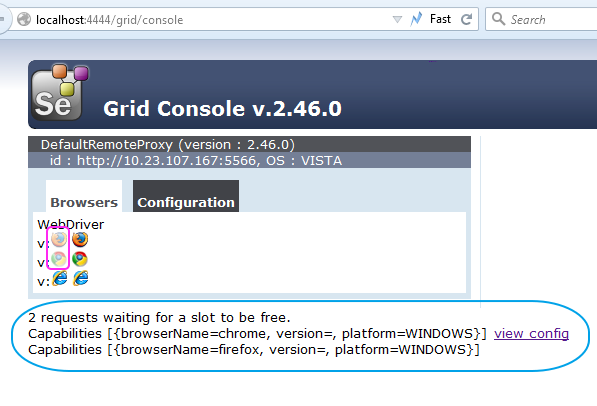 This way, maxSession will set max allowed browsers at a time to execute test on grid node.